Driveline is identical to that of the XF S AWD sedan, including the innovative AWD system that weighs just over 45 pounds. 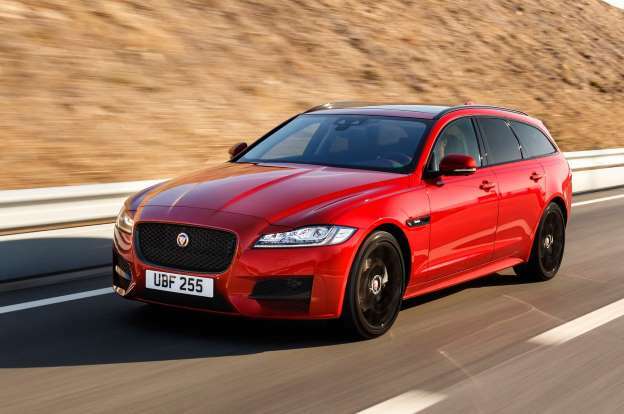 Jaguar claims a 0-60-mph acceleration time of 5.3 seconds, three-tenths of a second slower than the sedan, and one-tenth of a second slower than the F-Pace S, which is 30 pounds lighter. But when it comes to comparisons with the F-Pace, the numbers don’t tell the full story: although still as sporty and agile in the twisty bits as you’d hope it to be—it’s sportier and more agile than either the Mercedes-Benz E400 4Matic wagon or the Volvo V90, particularly in terms of steering feel and front end grip—the Sportbrake also rides much more smoothly and comfortably than its SUV cousin. The slightly longer wheelbase helps, as does the lower center of gravity. The Sportbrake flows nicely down a winding road and feels less agitated on choppy freeways. Although Jaguar claims the Sportbrake has 50:50 weight distribution, it does feel subtly different from the sedan because of the extra glass and metal behind the C-pillar. The front suspension is identical to the sedan’s, apart from bypass valve shocks that stiffen the damping rate during brisk driving. At the rear, however, the sedan’s coils have been replaced with computer-controlled air springs that keep the Sportbrake’s ride height constant regardless of the load it’s carrying. The trick to selling a wagon in America is to give customers in this small but profitable market niche what they want—a vehicle that artfully combines luxury and capability, performance and comfort, subtlety and style. And the 2018 Jaguar XF Sportbrake S does exactly that.